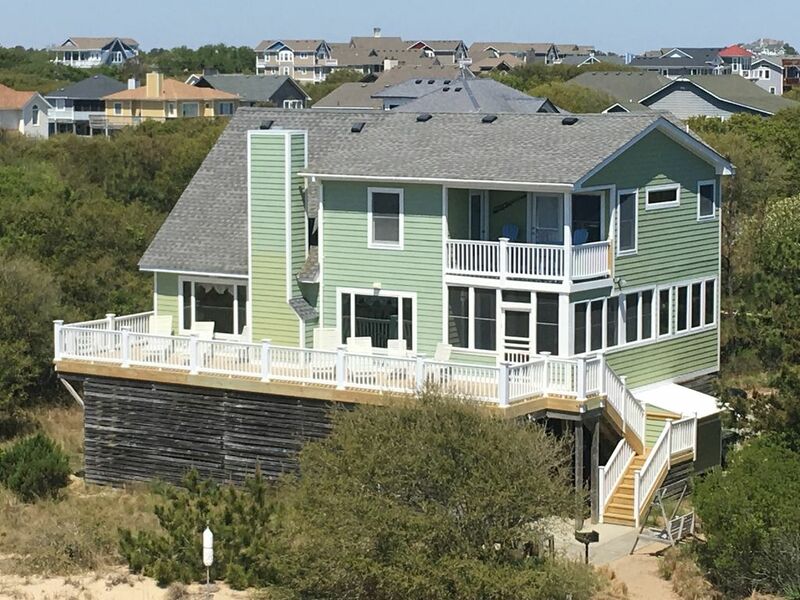 This is a rental vacation home in Corolla in the subdivision of Ocean Sands Section 'D' on the outer banks OBX of North Carolina. The home is located on open space with southern exposure, approximately 110 yards from the beach access or 130 yards from the beach itself. It rents from Sunday to Sunday. Cleaning is provided but you must bring your own linens and towels. The home is perfect for your family or multifamily vacation. Large kitchen, Florida room, decks and ocean views offer something for everyone. For the sports person, a basketball goal is provided, golf (Currituck Club) is less than 5 minutes away and tennis is only one block down the street. Two full size refrigerators both with ice makers. One refrigerator is in the kitchen and one is on the ground floor in the utility room. Large kitchen fully stocked with everything you'll need to cook and serve gourmet meals except the food. Inside dining table seats 12 (crowded). Outside on the adjoining porch is a picnic table (children). In addition there is seating at the adjoining kitchen bar. The house and location were great! One street away from the beach (which had plenty of space!) and a 1 minute drive to a shopping center with Harris Teeter and other shops! There's plenty to do in Corolla for activities or even in Duck, just south...both just a 5-10 min drive away. The house had everything we needed plus some! It was big enough to share with multiple families sharing the vacation, 2 refrigerators, beach chairs, beach toys, all the pots and pans you'd ever need, and a charcoal grill just to name a few. We really enjoyed the family dinners in the dining area and covered porch & evening relaxing on the large deck. Great place and location, and the host, makes it an easy and smooth transaction! Thanks Glenn! Thanks Kyle. I hope you can return soon. This was our second vacation at this property. It was great and relaxing. Perfect location for day exploration or spending time at the beach. The house has everything you'd want during vacation. Owners updated the decks, which is very nice. Would definitely recommend for a family vacation or even a small family reunion. Thanks. Thanks Yuliya. I'm glad you had another great time at the house. I hope you can return soon. Great home! Nicely equipt for families with plenty of beach accessories. I'm glad you had a good time. I hope you can return soon. This fall we are replacing the entire deck. One of the best houses! My family, including my sister's family, recently rented Glenn's Beach Retreat and we couldn't have been more pleased. From the location to the beach, house amenities, and layout of the house, it was a fabulous week. I would highly recommend anyone looking for a house rental in the Corolla area to check out this house, you will not be disappointed! Thanks Krystal. I'm glad you had a good time. Hope you can return in the near future. I'm glad everyone had a good time and thanks for the video. I posted it on Facebook. Everyone loves it. I hope you can return soon. The experience at Kelly's Beach Retreat exceeded my expectations. The owner is easy to work with no hastle and stress free. The house is centrally located to EVERYTHING, Heart of OBX. House has all ammentities, just bring your food, linens and swim suit. If you are looking for a cheap rental house that is kid friendly, clean and low stress just steps to the ocean and a few miles from 4x4 beach driving, I truly recommend Kelly's. Visit the Corolla Light House and enjoy the spectacular views of the barrier island. Just a few miles to the North, is the Corolla Light House and the Historic Hunting Lodge of the Whalehead Club where you can listen to concerts on the lawn or crab off the canal. A new nature museum is opening this Spring. Ride your SUV on the undeveloped beaches to the north or book a 4-wheel excursion to see the wild horses and Kayak on the sound. Wind surfing, parasailing and jet ski rentals are available as well as pubs and music. Right before the light house is a movie theater, shopping, putt putt, go carts and restaurants. A hour or two South is the North Carolina Aquarium, the Elizabethen Gardens, the Lost Colony of Roanoke, Jockey's Ridge dune, Oregon inlet and the Wright Brother's Memorial. At Jockey's ridge you can fly a kite or even hang glide. At Oregon inlet you can charter a boat to catch Striped Bass, marlin and tuna. There is something for everyone! Free hurricane insurance and early checkin at 2 PM. Dogs (2 maximum) are allowed only if well behaved and owner agrees to dispose of refuge in the trash. No pets allowed except well behaved dogs. Dogs must stay off furniture and beds. Pet fee = $75. Linen fee $200 includes bed sheets, bath towel set, beach towel and beds made for each occupant.